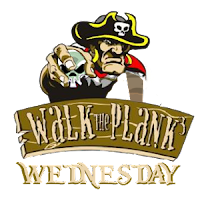 It's time for yet another Walk the Plank Wednesday! Pirates have stormed the Spiral as the realms keep filling up with all the new gamers! Have you started playing? Leave a comment about what you love the most about Pirate101 so far and what you are enjoying. I will look through the answers and I will select the answer I like the most and then that person will get a tier 7 KIFG code. I know that. That is why the winner will get their code when the codes are back up. Expired or not I'm leaving a comment. OK, what I like about Pirate101 is that the new combat system is more interactive than that of Wizard101.